David Blumenkrantz and Kalani Souza welcomes the PRIMO group to song at the 2010 Pacific Partners MeetingNational security is dependent upon our education and youth development policy and practices. 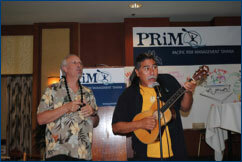 Youth & community development through rites of passage is one focus of the March annual meeting of PRIMO. The Center’s Founder and Executive Director and member of the Traditional Knowledge and the Environment Hui, David Blumenkrantz along with the Olohana Foundation’s founder an IKE Hui Steersperson M. Kalani Souza serve as host & convener of conversations at the PRIMO’s annual meeting in Hawaii, March 13-15, 2012. The Indigenous Knowledge and the Environment Hui - IKE Hui is dedicated to include indigenous knowledge, practices and science in the discussions on resilience, risk management, disaster preparation and response. There may be no greater asset in the arsenal of indigenous practices than rites of passage. It is for this reason that the IKE Hui and Olohana Foundation are in partnership with The Center. The Center’s partnership with the Olohana Foundation, PRIMO & the IKE Hui are exploring how youth & community development through rites of passage can help build community capacity and resiliency to hazards through collaboration. David and Kalani have served as conveners and hosts of conversations among federal agencies and First Nation leaders to help ensure that traditional knowledge and practices, as well as traditional peoples are engaged as “co-learners” and “co-creators” of methods that integrate contemporary theory with indigenous practices. PRIMO is demonstrating their commitment to incorporating all available knowledge and the inclusiveness of indigenous cultures through their partnership with the IKE Hui, The Center and the Olohana Foundation. The Center for the Advancement of Youth, Family & Community Services, Inc. and The Olohana Foundation are in relationship to help our children to make a better world. Together we are exploring and advancing concepts related to the twenty elements in an architectural structure for youth and community development through rites of passage. What if the answers to all of today’s problems were waiting to be born and mature out of the hearts and minds of our children? What could we do to help them nurture and grow their answers into our future reality for the survival of the planet and ourselves? Our unique approach – Honors the wisdom of the ancestors through the universal process of rites of passage – initiating children into the culture and context of their community and the natural world. Traditional knowledge, expressed by First Nation leaders, holds children as sacred and the seeds for their culture and the planet’s future. They have been articulating and infusing these essential values into the planning process for federal agencies. This has lead to advancing and adapting the principles and practices of youth and community development through rites of passage. Within the architectural structure for youth and community development through rites of passage elements number 11, Connection with Nature and 13, Connection with Ancestors feature prominently in design principles to build community capacity and resiliency to hazards through collaboration. All things are related. Both David & Kalani have spent their lives creating unique designs to foster authentic partnerships where participants “co-learn” and “co-create” their future. And, quite on purpose, they have fun and intentionally engage more and more people in their Play (the 14th element). Eating, playing and just plain being real human beings together forges the necessary foundation essential to authentic relationships. These relationships are critical for real partnerships to grow where people “co-learning” and “co-creating” their future. Kalani is serving as a primary convener and host of conversations on many of the youth and community development through rites of passage elements, especially Connection with Nature (E-11) and Connection with the Ancestors (E-13). It’s all about rushing to reflection and finding the good questions. The key to the answers for our most pressing problems today lies in the way we raise our children for tomorrow. We are purposefully convening and hosting conversations among and between diverse groups to address questions that matter related to youth and community development through rites of passage. “What if institutions that mattered in the lives of children were reframed as places of initiation? What would be possible now that was not possible before? What if teenagers were the prime responders to disasters? What would adults have to know and how would they transmit this information to teenagers to build their capacity to be the prime responders? Teenagers are among the strongest most adaptable and resilient members of our community. They are one of the strongest civilian assets to any community, especially during times of emergencies. The wisdom of our ancestors guides us to see that rites of passage were the central way values and skills were handed down to insure the survival of their culture and community, especially at times of emergencies. What are rites of passage? There are many different opinions reflected in thousands of “programs” with rites of passage in their name or claiming to provide rites of passage. Our approach integrates the wisdom of our ancestors with contemporary thinking in education, social science and public health. It is an ecological approach where both youth development and community regeneration are fostered through rites of passage. Understanding and comprehending the multiple challenges of youth and community development in contemporary society requires that we see the “big picture”. Most "programs" focus on just one or two isolated “problems,” which are only a part of the big picture. Our work is unique in that it focuses on youth development and community regeneration through the perspective of rites of passage. The Rite of Passage Experience© ROPE® with its 20 guiding principles sees the big picture where the whole community is engaged in the process of developing values and ethics that inform and guide expectations for behaviors that are healthy and life affirming for both the individual and the community. 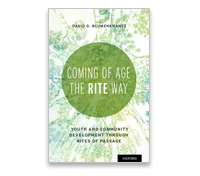 These principles were developed over 45 years of research and practical experience engaging adolescents and adults in schools, community, and civic and cultural organizations. It honors the wisdom and practices of rites of passage throughout human history, which were always based in the culture and context of community. EVIDENCE-BASED: Evolution is the best “evidence-based” documentation that something is important and working. Evolutionary biologists claim that a species does not maintain any practices for long periods of time unless it contributed to the survival of the species. There is documented evidence of rites of passage that goes back 30,000 years. 30,000 years of evidence-based results document the importance of rites of passage. The new concept of “evidence-based” programs is increasing coming under criticism for underlying flaws. Mostly – you can’t replicate practices, which are dependent upon an essential element that is so variable and unable to be counted. They are personal characteristics that manifest themselves in human relationships. Relationships matter in providing programs more than anything else. It takes a whole child to raise a village. The 20 principles are used to help guide a community’s creation of their rites of passage. Although the Rite Of Passage Experience has prescribed strategies that might mistakenly be considered a “program” the strategies are designed to foster a Collaborative Evolutionary Process for organizations, institutions and systems to co-learn about the art and science of rites of passage and build their capacity to co-create their rite of passage masterpiece. ROPE’s power and utility does not lie in its award winning “curriculum”, but in its ability to mobilize a community, within a shared emotional experience and common language, to create and continually renew their youth development policy and practices within a rites of passage framework. "True learning is experience. Everything else is information." "There is always an easy solution to every problem - neat, plausible, and wrong." Over 100,000 youth and their families across the nation and around the world have used the principles of ROPE® to participated in this evidence-based initiative.